Losses: It May Not Be a Question of "If", but "When"
TRUCKEE, CA--(Marketwired - December 01, 2014) - Clear Capital (www.ClearCapital.com), the premium provider of data and solutions for real estate asset valuation and collateral risk assessment, today released its Home Data Index™ (HDI) Market Report with data through November 2014. Using a broad array of public and proprietary data sources, the HDI Market Report publishes the most granular home data and analysis earlier than nearly any other index provider in the industry. Moderation continues for the 11th consecutive month. 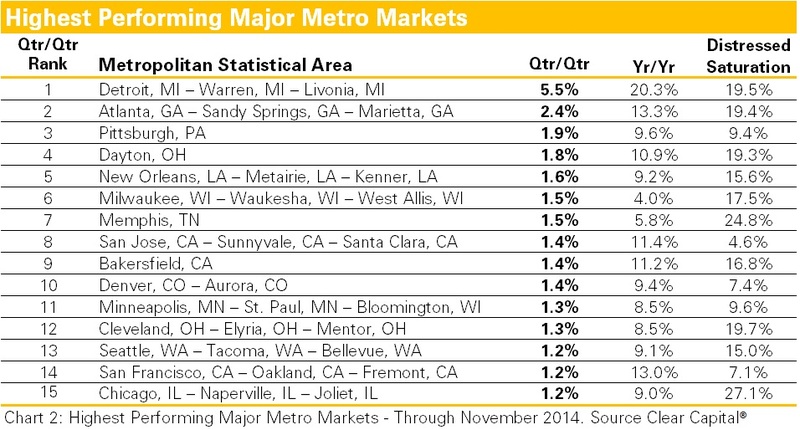 National home price gains fell to 6.7% year-over-year and 1.0% quarter-over-quarter. Meanwhile Distressed Saturation fell to just 16.8% suggesting the shortage of lower priced inventory is the catalyst for stalling gains. National trends were echoed at the regional level, with the West seeing the strongest moderation across the country. In fact, for the first time since the start of the recovery three years ago, the West's yearly rates of growth fell below 10.0%, a sure sign of more moderation to come over the next several months for the nation. The recovery engine stalls. Cash buyers competing for distressed and low-tier inventory helped to jump start the overall recovery, while supporting healthy price growth in this segment. At the height of the recovery in 2013, national prices including distressed sales (the all sale segment of the Clear Capital HDI) outperformed the performing-only sale segment of the market by 4.2 percentage points. Now the all sale segment is outperforming the performing-only sale segment by 3.0 percentage points. These segments' rates of growth will likely continue to fall in line with each other as investor engagement dwindles -- a result of fewer distressed sale opportunities. As this occurs, markets will be more reliant on performing-only sale demand and price growth. Potential trouble ahead. Improvements in the broader economic landscape have not instilled confidence in traditional home buyers (first-time, move-up, second home owners). The general lack of demand in the performing-only segment, coupled with a dwindling supply of distressed inventory, leaves the future of home prices squarely in the hands of traditional home buyers, who have yet to show any signs of re-engaging. Performing-only sales are not yet strong enough to support recovery-sized market growth without distressed sales. It's been a steady descent for national yearly rates of growth. They have dropped five percentage points from a high of 11.7% in December 2013. This is due in part to the market's natural normalization as the correction to the correction subsides and distressed sale inventory dries up. While this is healthy for markets overall, the weakness of price growth in the performing-only segment is further cause for concern. Excluding distressed sales, performing-only national home price growth over the last year was just 4.4%, down from a recovery high of 7.2%. Even more concerning is the performing-only segment's drop in quarterly growth to 0.6%, nearly cut in half over the last rolling quarter which saw quarterly rates of growth at 1.1%. 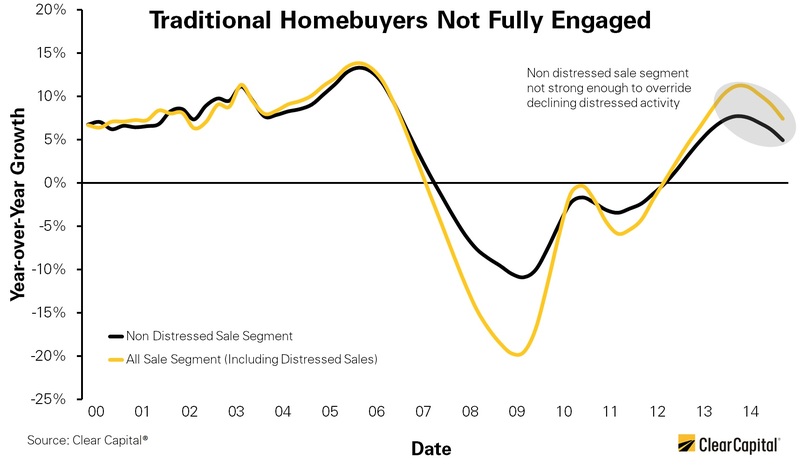 Reduced reliance on distressed sales and diminishing gains in the performing-only sale segment could be too much for the recovery to overcome as we enter winter. The recovery is at a tipping point. 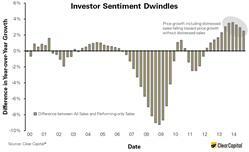 Markets need non investor demand to ramp up, and homebuyer confidence restored. Should this turn into a negative feedback loop, the likelihood for quarterly price declines at the national level could turn into yearly price declines by the end of 2015. 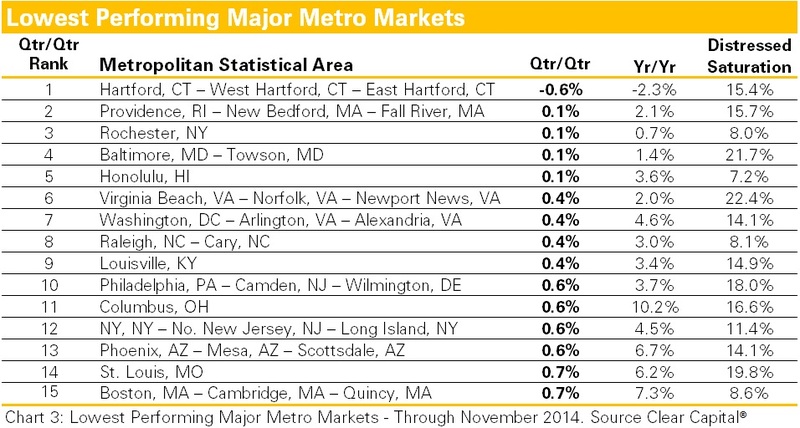 Contact Alanna Harter for your November 2014 file of the Top 30 MSAs or to access our data on the Bloomberg Professional service by typing CLCA < GO >. "Performing-only sale trends are a bellwether for what's to come in 2015," said Dr. Alex Villacorta, vice president of research and analytics at Clear Capital. "Think of home price growth since the housing collapse as a bouncing ball, where each successive bounce causes some energy to be lost and eventually movement stalls. We see this on a few different levels. First, we see the delta between performing only and all sales, including distressed sales, merging (Graph 1). This confirms markets are no longer driven as much by investor demand for discounted distressed assets. 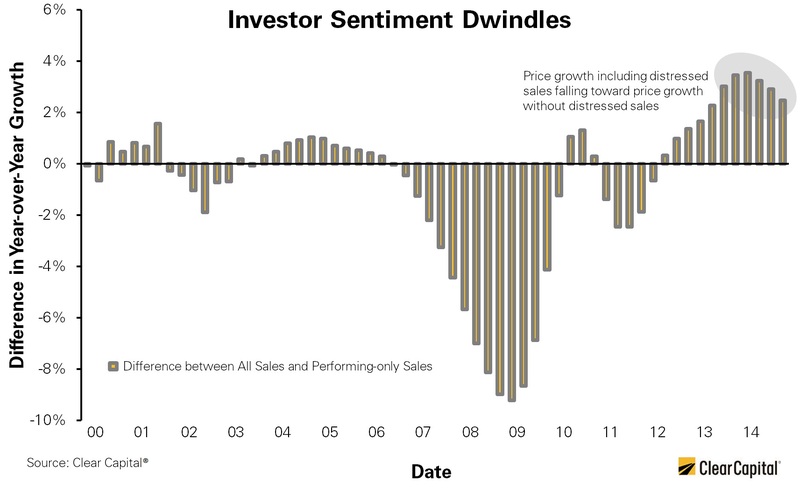 "Additionally, we see notable weakness in the performing-only sale segment, a sign that non investor buyers are not engaged enough to support the recovery. As markets continue to normalize, we'll see reduced growth from the distressed segment, which is a good thing for the market overall as the legacy of the housing crisis fades in the rear-view. Yet, should national rates of growth turn to losses as a result, non investor homebuyers will likely further disengage. Quarterly losses could snowball into yearly losses, and create a negative feedback loop. At this point, the market showing signs of weakness is a cause for concern." Offers the real estate industry (investors, lenders, and servicers), government agencies, and the public insight into the most recent pricing conditions, not only at the national and metropolitan level, but within local markets as well. Is built on the most recent information available from recorder/assessor offices, and then further enhanced by adding the company's proprietary streaming market data for the most comprehensive geographic coverage and local insights available. Reflects nationwide coverage of sales transactions and aggregates this comprehensive dataset at ten different geographic levels, including hundreds of metropolitan statistical areas (MSAs) and sub-ZIP code boundaries. Includes equally-weighted distressed bank owned sales (REOs and short sales) from around the country to give the most real world look of pricing dynamics across all sales types. Allows for the most current market data by providing more frequent updates with patent pending rolling quarter technology. This ensures decisions are based on the most up-to-date information available. Clear Capital (www.ClearCapital.com) is the premium provider of data and solutions for the mortgage finance industry. The Company's products include appraisals, broker price opinions, property condition inspections, value reconciliations, automated valuation models, quality assurance services, and home data indices. Clear Capital's combination of progressive technology, high caliber in-house staff, and a well-trained network of more than 40,000 field experts sets a new standard for accurate, up-to-date, and well documented valuation data and assessments. The Company's customers include the largest U.S. banks, investment firms, and other financial organizations. Clear Capital's home price data can be accessed on the Bloomberg Professional service by typing CLCA < GO >.